An all-Native American film team won two of the top awards at the recent Portland 48 Hour Film Project. Film producer is Isaac Trimble, and the director is LaRonn Katchia. Cast and crew are known as Team RedFawn, bringing authentic Native American and Indigenous issues to the forefront of mainstream cinema. Set in a rural reservation town, the story begins as two detectives—played by Solomon Trimble (Sam Uley of Twilight), and Isaac Trimble—investigate the homicide of a young woman marked with a killer’s deadly signature. With the assistance of entomologist Brett Rivers, played by actor David Velarde, the detectives soon realize Brett may have a lead on this murderer’s lethal trademark. Taking them on a mysterious journey through the dense forests of the reservation, the detectives are soon on the trail of an elusive, faceless killer. What unfolds is a heart wrenching story of a silent epidemic, the disappearance of Native American and Indigenous women. Native American women are murdered at more than 10 times the national average. The true number of these missing indigenous women is unknown. While many of these cases go unsolved, and are forgotten or ignored by American governments, these women are more than just statistics: they are mothers, sisters, grandmothers, aunties and daughters. Missing Indigenous captures the emotion that continues to burden the families and communities affected by the loss of these women. Bringing an all Native cast and crew together was paramount in making the emotional connections in representing the authenticity of Native American people, LaRonn Katchia said. As Missing Indigenous gains exposure throughout the industry, he said, team RedFawn remains humbled by authentically and accurately representing Native American lives, communities, and realities through film. 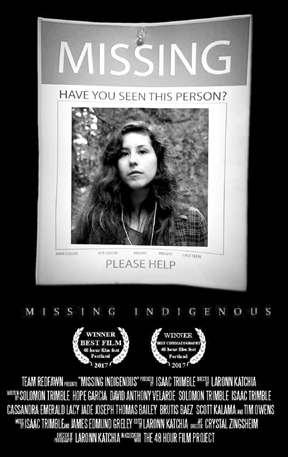 As the team prepares for Filmapalooza, held in Paris, France in March 2018, they plan to enter Missing Indigenous into other film competitions and festivals. The 48 Hour Film Project is a wild and sleepless weekend in which a team makes a movie—write, shoot and edit—in just 48 hours. On Friday night, teams draw a genre from a hat. They are then given a character, prop and line to include in their films. On Sunday night, in a wild dash to the drop off event, the film is turned in—and teams celebrate. The film is then screened at a local theater in front of an audience of filmmakers, friends and families. The 48HFP is the world’s oldest and largest timed filmmaking competition. The 48HFP is all about creativity and fun. It’s also about community. For years the 48HFP has been helping local creative people connect to make films. These connections go beyond filmmaking—taking part in the 48 helps people find friends, collaborators and jobs. There are even some couples, including married couples, who met through the 48.